This is an example of a complete blood count (CBC) done by an outside lab. It includes some information from viewing a blood smear preparation viewed under a microscope. These results are from a patient diagnosed with Evans Syndrome. The first piece is WBC, or the total white blood cells. This can indicated infection, or other diseases that can effect the overall white blood cell count. The RBC is the total red blood cell count in microliters. HGB is the hemoglobin count. This is commonly decreased in patients that are anemic and will typically go up with an increase in red blood cells. If this is chronically low, it may help to check iron stores to make sure the pet does not also have an iron deficiency causing further anemia. The HCT is hematocrit and is very similar to PCV. This number is calculated, so most veterinarians prefer a PCV since that is a manual look at the blood. MCV, MCH, and MCHC are measurements of the red blood cells. MCV is the mean corpuscular volume and is the average volume of the RBC. MCH is the mean corpuscular hemoglobin or the average amount of hemoglobin in a RBC. MCHC is the concentration of hemoglobin within the RBC. Reticulocytes are young red blood cells. If we see a higher than average number of young RBC’s we know the body is responding to anemia if it is present. If the patient is anemic and there is no increase in reticulocytes that indicates a non-regenerative anemia, or the body is not responding appropriately to being anemic. NRBC is a nucleated red blood cell and indicates a young red blood cell. As RBCs age they loose their nucleus. Again, an increase in these indicate regeneration. The white blood cells have two sets of values. The first is a percentage. This indicates the percentage of each type of white blood cell in the total WBC count. 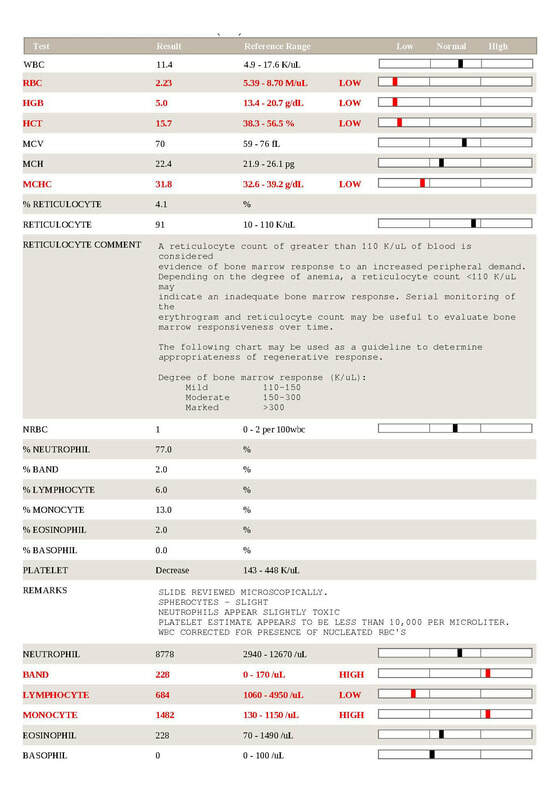 The second set of WBC values indicates the total number of those individual cells within a microliter of blood. To get more information on what these cells do check out the hematology page here. Remarks: This blood sample was reviewed with a blood smear under a microscope. This sample had spherocytes in the sample. This is a condition of the red blood cell that is diagnostic of an immune mediated destruction of the red blood cell. It also says that the “neutrophils appear toxic”. This indicates an inflammatory process is occurring in the patient. The last piece of information is about the platelets. In this sample there are less than 10,000 platelets per microliter of blood. Again, this is a patient diagnosed with Evans Syndrome a disease that attacks both red blood cells and platelets.